Yes, that’s my brand new character waving at you. After complaining about never getting a Horde character to level cap I decided to try once again. 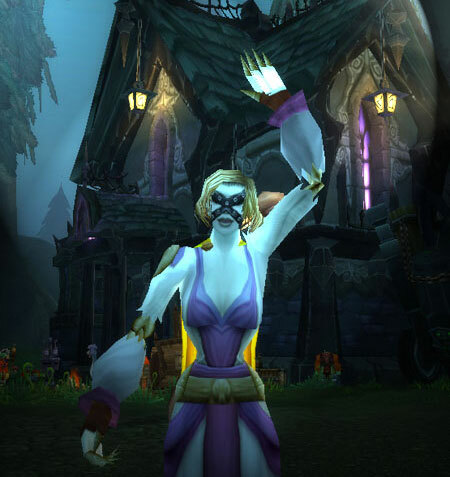 She’ll be the only Horde character I have on this server so it will be like old times, she has no big sisters to send her money, heirlooms or any other goodies. After taking a look at the auction house I was horrified by the prices so I decided she’d have to be a tailor to have something to wear and a herbalist for (hopefully) the money. Yesterday while picking Peacebloom I got a whisper asking if I’d group so the person could do Molten Core. I said sure and went on with my flower picking. When I logged back in last night I received mail with 150 gold and a “Thank You”. I was stunned, boy can she ever use that money. I don’t know if the person mentioned gold in the whisper, if they did it didn’t register and if they did and I had seen it I would never have assumed that I’d actually get it. It made my day and I thought it was an incredibly nice thing to do for a lowly little warlock. Maybe a year ago I was running around Stormwind on my level 11 warlock, no heirlooms, no fancy gear and noticed a level 80 stop near me as though they were inspecting me which was silly as why would someone want to inspect a level 11. I noticed the character’s name as it was the name of a group whose music I enjoy. The next time I logged into that character she had mail. The subject was “Random Act of Kindness” and it contained 35 gold and it was from the character I had noticed. On occasion I feel like turning off all the chat channels as sometimes it’s so depressing. I’ve been yelled at (okay cap-locked at but it feels like yelling) for not helping someone kill something and yelled at for trying to help someone kill something, I’ve been ore ninjaed, spit on, called a noob, the list goes on as I’m sure it does for most people but then something like this happens and I realize there are nice people in Azeroth they just aren’t the ones talking trash in Trade so sometimes you forget they’re there but they are. Thank you, random acts of kindness doers, I will pass it on. You know I just realized that both the characters who were the recipients of all that gold were warlocks, um, you don’t think they did anything to make that happen do you, I mean casting some dark mojo on people to get their money, I hope not but you never know with warlocks. I’m sure most of us haven’t been able to do everything we’d like to. 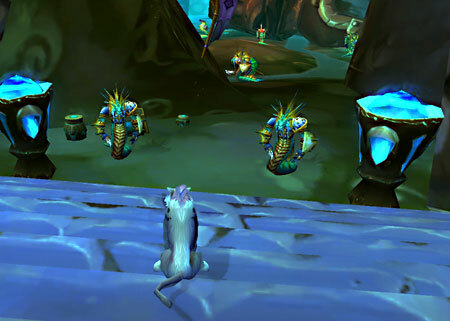 Most things I’ve missed don’t bother me much with some exceptions (where is that stupid little fire breathing dragon already) but the fact that I haven’t leveled a Horde character to the level cap really bothers me. I started out with the Battle Chest and played through those as I didn’t think I’d be interested in the online game. When I was finished I so loved the Horde, my sympathies especially were with the Undead. My son-in-law bought WoW vanilla for me and I said I was going to roll Horde side, he was horrified, no, no, you must be Alliance he said so I did. Well now, many WoW years later I’ve had ample opportunities to level up a Horde character and zip, nothing, nada. Why, you might ask? This is embarrassing but largely because of those freakin’ Flight Masters. I don’t know how many times my poor Horde characters have merrily run up to an Alliance Flight Master and been annihilated. I have played Alliance so long I can’t seem to remember that they’re the enemy while playing Horde. 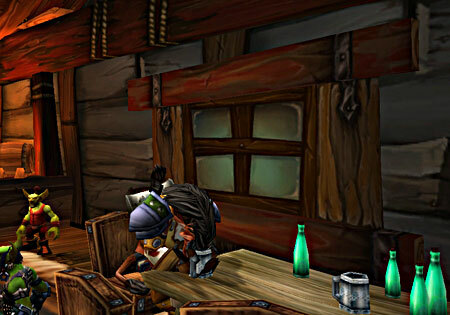 It takes its toll, as you can see my highest level (45) has taken to drowning her sorrows at the Inn in Booty Bay with her buff from Midsummer Fire Festival still on her. This doesn’t really help as odds are she’ll get so smashed she’ll run right up to that Dwarf Flight Master up there for the bazillionth time and die a horrible death—yet again.